Life in New Zealand seems good, there are regular reports of an improving economy and we have just had a record amount of money spent on art over the past year. Over $20 million worth of paintings have been sold through auction rooms and I'm sure many millions more have been bought from dealer galleries and directly from artists. A Charles Goldie sold for $730,800 and Bill Hammond got the best price ever for a work from a living artist ($328,300). There is money about and people spending. 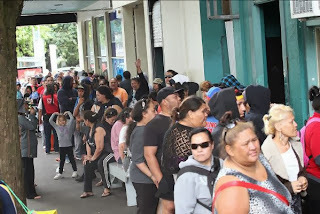 Sadly there are two distinct worlds in New Zealand now; those of us who look forward to Christmas and all that it traditionally involves and those who dread it because even basic expectations of what we think as Christmas are unaffordable. Today's Sunday Star Times had numerous articles describing the latter. Shop Santas describe conversations with children that have them returning home emotionally exhausted. Many children don't ask for the toys as they used to but for things we once considered basic necessities for living in a developed nation, like living in a house rather than a car or garage. "This year's Christmas wishes are sadder than ever," says Robert Fisher, who has been the official Santa at Auckland's Westfield WestCity for nine years. 2500 people are expected to attend the Auckland City Mission Christmas dinner this year and already the mission has given out 3000 food parcels, up from 2400 the previous year. People are not expecting anything special in their Christmas food parcels like a ham or cake, but are just asking for basics like bread, milk and baked beans. Christmas dinner for some will mean feeling grateful for having any food in front of them. Queues outside the Auckland City Mission, Christmas 2012. There was also the heartbreaking article of of how we treat asylum seekers in New Zealand. Such people get none of the support we provide those arriving under our UN quota. The 100 or so asylum seekers who are successfully given refugee status each year struggle to get that status and often have to survive in exploitative jobs (paid well below the minimum) and have limited access to support services. It took seven years for the Mundele family to receive refugee status and another nine to get residency. Racial and cultural bias still seems to exist within the immigration department. There is also an upsurge in family violence over Christmas as finances are stretched and and families are stressed. While retailers spend up on advertising and the commercialization of Christmas, it is terribly hard on those who do not have the money to participate. At least 270,000 New Zealand children will wake up on Christmas day with little expectation that it will be much different from any other. I will probably have Christmas Day with my extended family as I have in the past, over-indulging in food and wine while surrounded by the wrapping paper left from the present opening earlier. While my donations to various charities will hopefully help provide something for those less fortunate, I do feel uncomfortable that such inequality is now common and that what my family experiences is becoming less normal than it was.